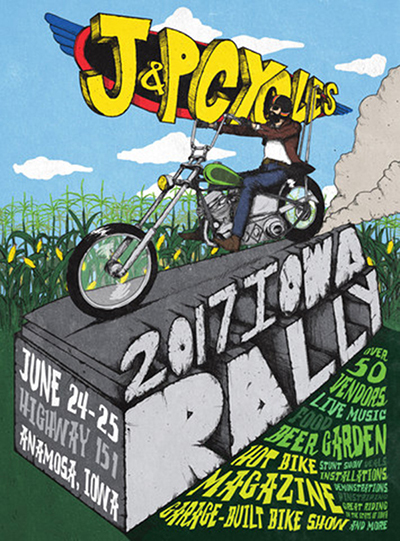 J&P Cycles say their Anamosa, Iowa location will become the largest motorcycle aftermarket store in the world during the weekend of June 24-25, 2017 as the J&P Cycles Iowa Rally celebrates its 38th anniversary by becoming the site of Hot Bike Magazine's National Garage Build-Off for custom motorcycles. The competition is expected to draw the nation's top garage-built custom bikes competing for $3,000 and an invitation to the annual Hot Bike Tour, where their motorcycle will go up against famous builders in the Invitational Build-Off. Located at J&P Cycles' original store, the free rally includes motocross stunt shows from Cowboy Kenny's Steel Rodeo Tour, live music throughout the weekend, food, beer and opportunities to support Camp Courageous, a camp for kids and adults with disabilities. The Iowa Rally is a chance for riders to get up-close and personal with reps from more than 50 companies offering motorcycling products. It's a chance to see the newest motorcycle accessories, and ask questions to experts from companies like Vance & Hines, Kuryakyn, Dunlop, Klock Werks, Metzeler, Mustang Seats, Rinehart Racing, and many more. Riders can even have selected parts installed on their bikes on site.